The Community Infrastructure Levy (CIL) is a planning charge, originally introduced by the Planning Act of 2008. It is applied by councils when someone secures planning permission for most types of new building. Different councils charge different levels of CIL while some don’t charge it at all. Find out more on the Planning Portal. The money raised by the CIL charge is used to fund a wide range of local infrastructure costs such as flood defences, schools, hospitals and other health and social care facilities, parks, green spaces and leisure centres. Any new build house, flat or an extension of more than 100 square metres gross internal floor space is likely to incur a CIL charge (where a council has introduced the CIL regime). The amended regulations came into force in March 2014 but allowed for a CIL exemption for self builders building either a new dwelling, an annex to an existing dwelling or an extension to an existing dwelling intended to be your principal private residence. While this is good news for Self Builders, there are caveats and the procedure to claim exemption which must be followed to the letter. Any exemption must be granted prior to the commencement of the development or the full levy due will apply. You will usually need to advise the local planning authority before commencement, so be sure to seek agreement to the formal claim for exemption before starting any work on site. It’s important to note that there is a three-year ‘clawback’ arrangement whereby if you sell or let your self build home within 3 years of occupancy, the full CIL that would have been due will be payable. Also, if any exempted annex is used other than as part of a single dwelling, is let out or sold (unless as part of the main dwelling and to the same purchaser) then the full levy due will be payable. Take a look at this court ruling for a cautionary tale of what can happen if you don’t get the procedure right. Section 106 payments are a planning contribution requested to support affordable housing. 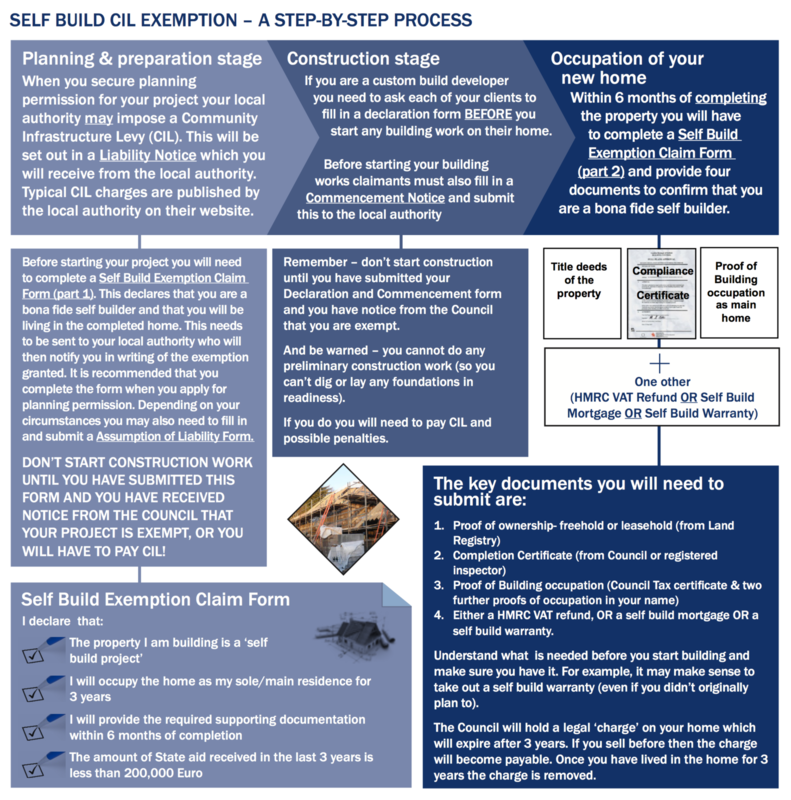 In 2014, Self-builders were declared exempt from S106, but this was successfully challenged in 2015 and deemed unlawful. The current status is unsure, so contact your local authority and investigate their approach to Section 106 contributions. Some are still exempting, but not all. In March 2014 the Government published a consultation on Planning Performance and Planning Contributions. This consultation sought views on changing the assessment criteria on how local planning authority performs and importantly on changing the threshold for Section 106 (S106) contributions for small- to medium-sized developments. In November 2014 the government published its response highlighting the removal of most Section 106 charges for schemes of 10 units or less, with respect to specific criteria. This change to planning policy was made to the National Planning Practice Guidance on 28 November 2014. As such, this was a material consideration for all new planning applications. The 28 November 2014 guidance referred to the exemption from affordable housing contributions, S106 contributions or pooled tariff-style contributions for developments of ten units or less should the total combined floor-space be 1000m² or less. The changes only apply in England; however local authorities must now take the guidance into account from the date of publication. In Areas of Outstanding Natural Beauty or National Parks, local planning authorities may choose apply a lower threshold of five units or less. Where this is the case developments of six-ten units should not be required to provide affordable housing on site. What does S106 exemption mean? For qualifying developments the exemption means that affordable housing contributions – either as payments or on-site dwellings – will not be applicable. In addition, tariff-style planning obligations such as CIL or S106 planning obligations will not be applicable where they would contribute to a pooled funding ‘pot’ intended to fund the provision of general infrastructure in the wider area. However it should be noted that contributions can still be sought for site specific obligations such as infrastructure improvements (e.g. site access or highway improvements) should these been appropriate to the scheme. If I paid it already, can I claim it back? If you paid a contribution and built out or are building a scheme then you would be unlikely to claim costs back as the guidance came into force on the 28 November 2014. What if I've agreed to pay it - can I claim it back? Planning obligations can be re-negotiated at any point. If permission has been granted and you have not yet signed your legal agreement then you are able to re-negotiate and this is something that the Local Planning Authority (LPA) should facilitate. In addition, if you have signed the agreement but not started work, the LPA may also agree to a re- negotiation in light of the new guidance. If negotiations should be unsuccessful then another application would be required. What if I'm just starting the planning process? Theoretically, your scheme would need to be designed to be under the unit and floor-space thresholds; but check with your local council’s planning office first. NaCSBA has been lobbying on behalf of Self-builders and Custom Builders to ensure that Self-builders are exempt from CIL and around the issue of Section 106 contributions. After a major campaign run by the National Custom & Self Build Association (NaCSBA), the Government has confirmed that self builders (and the clients of custom builders) will be exempt from paying the Community Infrastructure Levy (CIL). We continue to push the argument for Section 106 exemptions. Have any councils resisted the Section 106 exemption? Yes. A number of local authorities have decided to continue to request S106 Affordable Housing Contributions (AHC) while they lobbied for the decision to be reviewed. However, we have been made aware of successful appeals against such councils looking to apply the S106 levy.